If you take a firearms course, you learn the basics — how to load your gun, how to shoot at targets, how to clean your gun, etc. But the one thing they don’t and can’t really teach you is how to react to a real life situation. At the range, you’re in control of your gun and the target you’re shooting at. You know what you’re going to shoot at and when. You can take your time or shoot as fast as you can. You set the mood and the timing. But, if you encounter someone in a real situation where you need to use your gun, you don’t have time to think it through. There are stories of surveillance footage of victims shooting at the bad guy every which way but loose. They look panicked and they are. Their shots go wild, which could hurt or kill a bystander and give the bad guy a chance to win. Yes, it’s a stressful and unexpected situation, but you can take control. Check around in your area to see if there is a range or law enforcement facility that has either a video simulation of different situations with bad guys, or a “live” staging area with buildings and popups of people (much like Hogan’s Alley at the FBI Training Academy in Quantico, Virginia). Just do a Google search on firearms training simulators and you may be surprised to find one near you. If you don’t have one near you, you can set up a different kind of target on the range or wherever you practice target shooting. A favorite used by law enforcement is called an SEB Scoring Target, available online for as little as a quarter a piece. Unlike normal targets, this has a body outline shape with triangle for the head, a square at chest level and another square at belly level. On either side of the target are two circles at the neck level, numbered 1 and 2, then two squares below those numbered 3 and 4, and two triangles below those numbered 5 and 6. 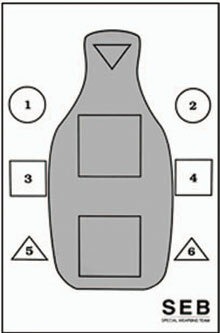 You can also find the images for these targets online and make your own. You can mix it up by using more than one target at a time, come up with your own commands, or use different targets spaced about two to three feet apart. You will need a friend to call out the commands in random order for you. Or, if you can’t find a friend to come with you, download an app from iTunes called Combat Focus Shooting: Balance of Speed and Precision Shot Timer By Boxkite Media for just $1.99. This will randomly call out commands for you. Remember, practice makes perfect. . . At least as perfect as you can get for an unexpected situation.